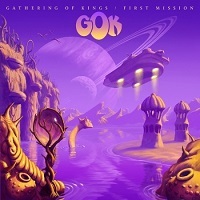 GATHERING OF KINGS (GOK) is not a band but more of a collaboration of amazing talent. The album “First Mission” was released late January 2019, and has captured a variety of listeners. All songs were written by Victor Olsson except “The Runaway,” which was written by Maurice and Robin Gibb of the BEE GEES, and was a hit single in 1986. GOK was the brainstorm of Ron Dahlgren, who wanted to assemble talented musicians of Swedish Hard rock. After a year of hard work, his vision became reality with the help of twenty-two of the most talented musicians and producers. The cast is long for this project, so I am eager to turn up the volume and see what this creation holds. The album leads off with a one minute intro, “The Gathering,” where all instruments are played by Victor Olsson. It is brief and subtle but takes us into the force of “Forever And A Day,” the single released late 2017. The vocals of Björn Strid are beautifully crafted around the music filled by keys, strong beats, and wonderfully crafted guitar riffs. “Love Will Stay Alive” is sung by Rick Altzi and it is really hard to not distinguish the vocal tone from the previous song. The music is simply beautiful and keeps pace with the beginning of the album. The guitar solo is the real highlight of the song. “Endless Paradise” breaks out a powerful love ballad reminiscent of the 80’s classics. The soft swoon of the vocals carry the music even more and add a different element that captivates your heart. “Passing Rain” is a powerful ballad that reminds me of "18 and Life" by SKID ROW. Instead of having those highs of Sebastian Bach, you have the lows of Rick Altzi. It holds an atmospheric dark vibe but the song never loses its true essence. The final cut, “Battle Cry,” has Altzi at the reigns again. There are others at the helm, Tobias Jansson – “Out Of My Life” and Jens Westin – “Lonely Road,” who hold true to the album's feel. “Battle Cry” is that song you want to end a record though. The strong riffs thrown over the keys and beats just keep you going with the entire 80’s Melodic rock feel. GOK is definitely a massive compilation of overseas talent. Ron Dahlgren has put together all of the right musicians in the right places to make such a great album. The music takes me back and keeps me thinking. “This song could have been on this soundtrack, and this one here”. The production quality simply amazes me as well. Every instrument, every voice, holds a certain distinction, without taking away from the vision placed before them. As for seeing them live, I am unsure of how you could even arrange a show with so many contributors, but I am sure if it can be done, they will all find a way to make it happen. If it happens, you will certainly want to be in the crowd for such an awesome display.